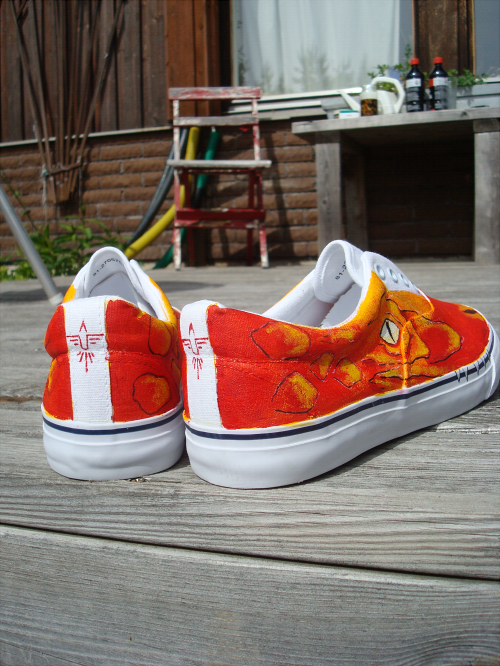 My friend Linus drew this picture a while back, of a really neat pair of shoes. 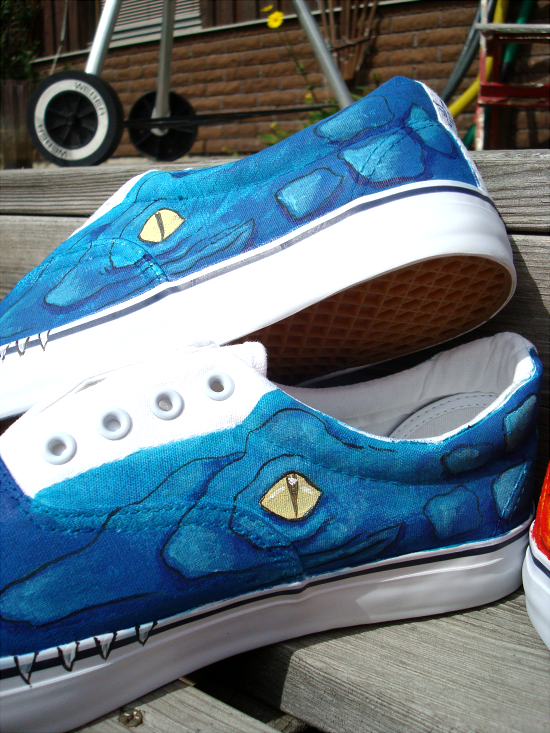 They had dinosaurs on them. 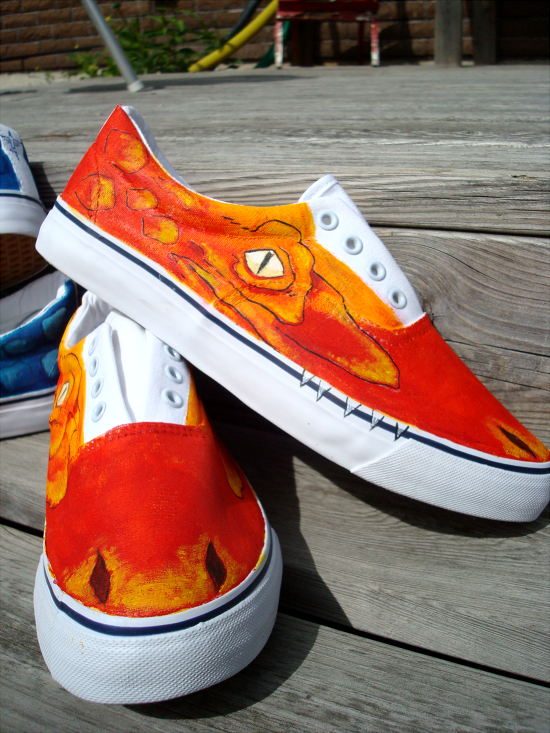 I demanded he paint them IMMEDIATELY, but alas, he didn't have the time. I did, though. In spades. 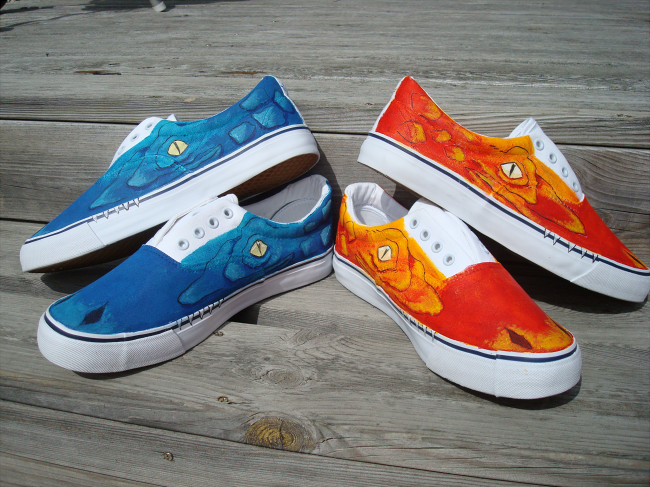 And my other friend Alek wanted a pair, too. 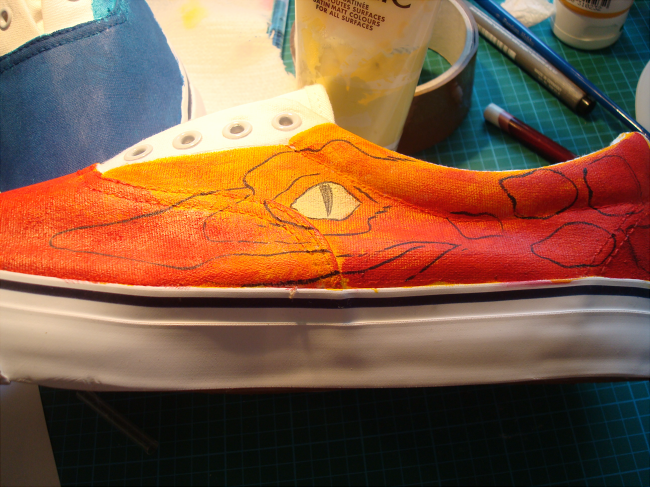 So, the shoes are now dinosaurs. 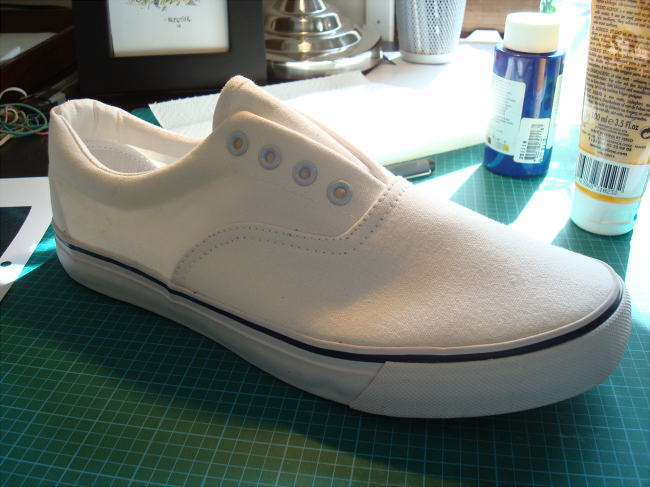 I bought two pairs of white canvas shoes, one each for Alek and Linus. 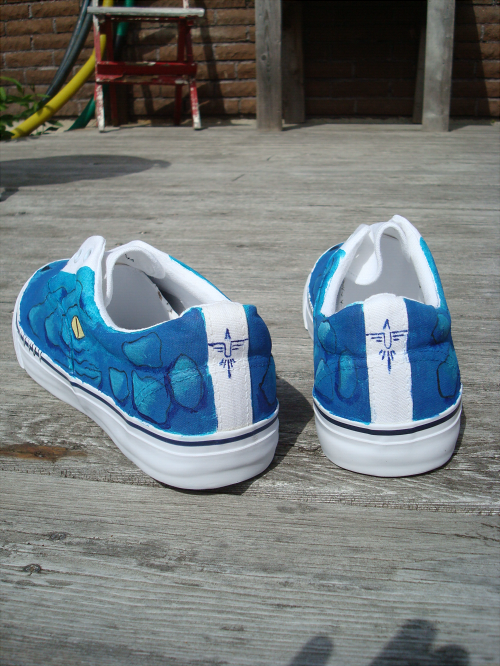 Took off the laces while painting, but kept the cardboard-thing in the toes to make sure they stayed the proper shape. 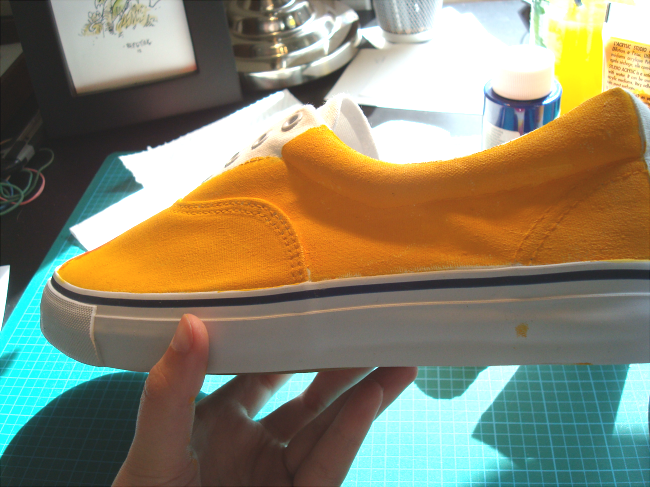 Linus wanted his to be red, so I base-coated them in yellow acrylic to cover up all the white spots. ... 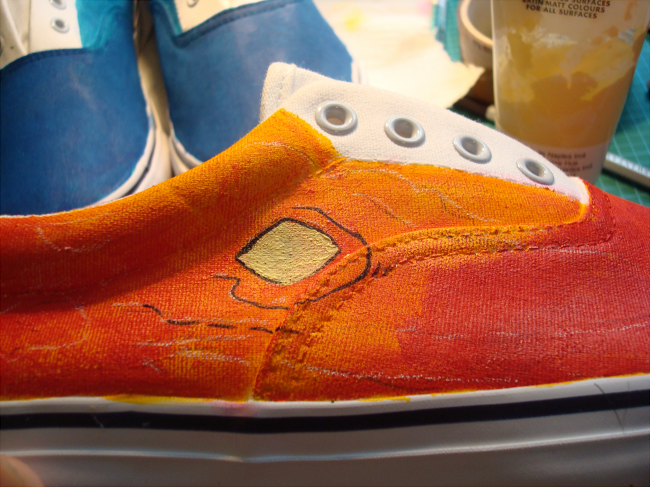 I then went over the yellow with red fabric paint; a thick coat over toes and heels, but drybrushing it over the sides of the shoe so that the yellow still shows through a bit. 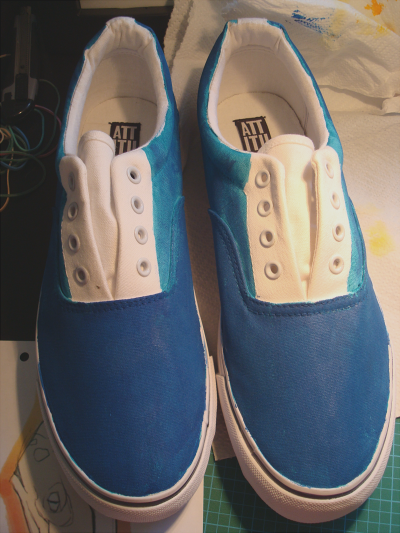 Alek's shoes, which were base-coated in a lighter blue-green fabric paint, and then painted over with a mix of dark blue mixed out with white, to take the edge off the extreme saturation. 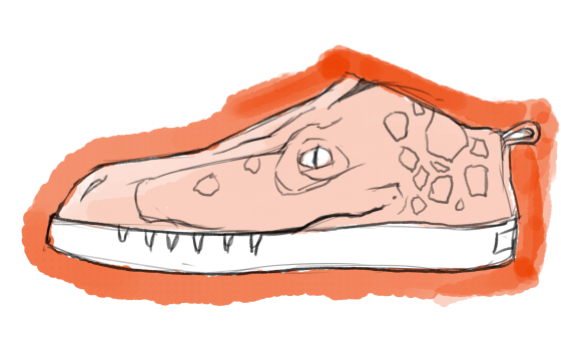 Some close-up shots of the basic lines: sketched out with coloured pencils, painted in acrylics; Naples Yellow for the eyes, regular black for the lines. And it's already starting to look kind of neat, but it's not quite there yet. 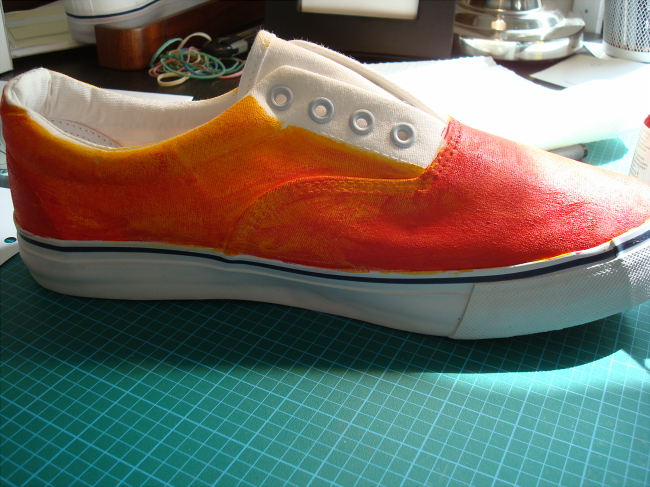 Added yellow acrylic highlights, and some shadows with the red fabric paint, to bring out the lines. Looks a lot better now! 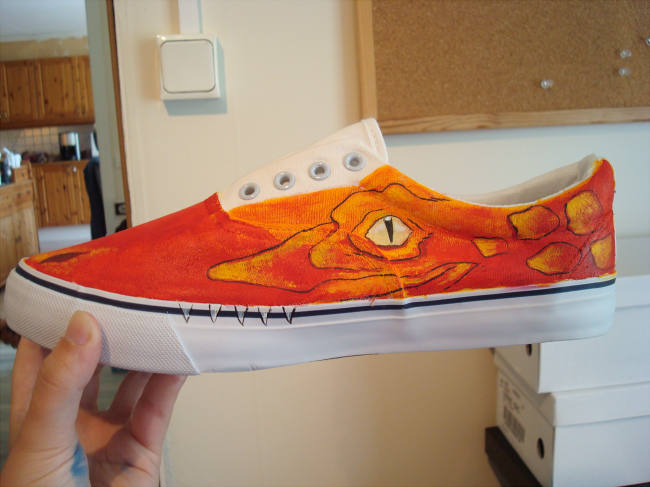 And here they are - the finished dinosaur-shoes! Hahaha - tack! :D Jag är nöjd själv; blev faktiskt riktigt bra. Funderar på att måla ett par till mig själv också - fast typ gröna, eller så. Ska ta reda på vad det kostar att skeppa dom över Sverige till er, så ska dom nog vara på väg snart.